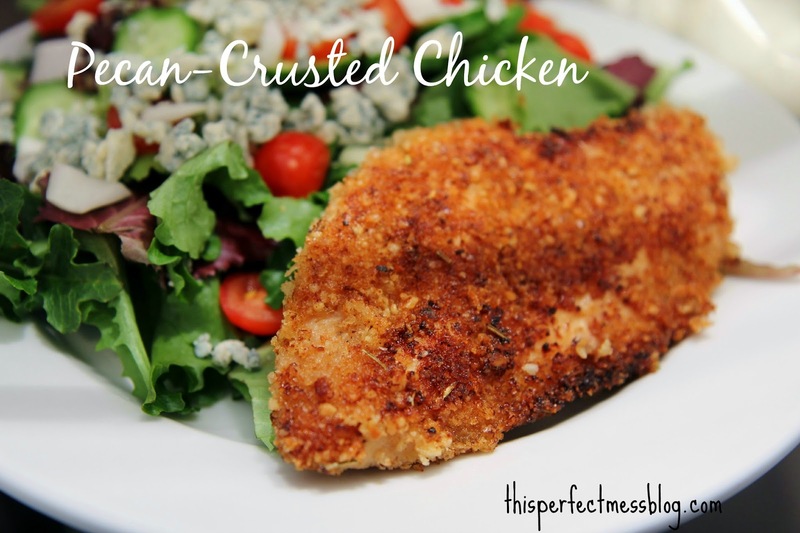 Pecan-Crusted Chicken is subtly sweet with a delightful crunch and the nutty pecans add an incredible layer of flavor. Don't let the name intimidate you, this is just a fancypants version of a breaded chicken cutlet. In this freezer meal, most of the prep work is done ahead of time, so this dish even works great on a busy weeknight. And sometimes your average Tuesday night could use a little fancy, dontcha think? First, slice 2-3 large chicken breasts into cutlets. Then, in a ziptop bag, marinate the chicken cutlets in about 1/2 cup of maple syrup. Yes, maple syrup! It's the secret ingredient that gives the chicken that hint of sweetness. 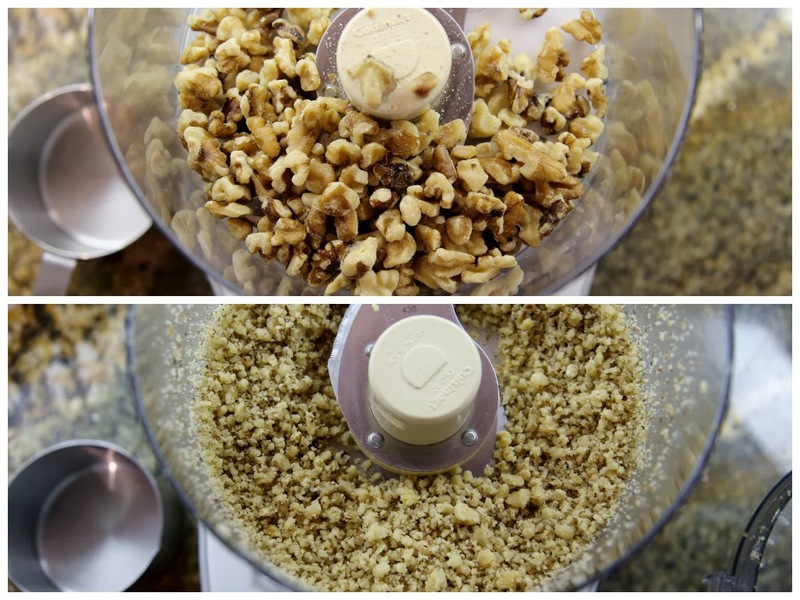 Next, take 1 cup pecans and coarsely chop them in a food processor. If you don't have a food processor, you can put the pecans in a plastic baggie and crush them with a can or the bottom of a frying pan. I actually used walnuts here because it was what I had on hand. I'm just pretending they're pecans because pecans sound so much fancier. Mix the chopped nuts with 1 cup panko bread crumbs, 1 tsp salt, 1/2 tsp pepper and store in a ziptop baggie. You can place your marinated chicken and topping in a gallon bag and throw it in the freezer. Now you've got yourself a meal kit on hand! When you're ready to cook, thaw your meal kit. Dredge the chicken in the pecan/breadcrumb mix. You can do it assembly line style, shown below, or you can pour the pecan mix into the gallon bag and toss each piece of chicken around to coat (one at a time) shake-n-bake style! Make sure all the crumbs are pressed in well. Now, this next part is a little tricky, but if you follow all the steps, you should be good to go! First, heat your skillet to medium heat. Add enough oil to completely coat the bottom of your skillet - don't skimp! If there is not enough oil, the pecan crust will burn. Let the oil heat up, then drop in a breadcrumb to ensure the oil is hot enough. If the breadcrumb sizzles and bubbles, you knows the oil is ready (you don't want to put the chicken in before the oil is hot, or it won't brown properly). Next, carefully place your chicken in the skillet. If your pan isn't large enough to cook all chicken breasts at once, cook them in batches rather than overcrowd the pan. After your chicken is in the skillet, leave it alone for 2-3 minutes. No poking or prodding! Moving the chicken around will cause the crust to come off. After a few minutes, take a spatula and quickly slide it under the chicken. Before you flip it over, make sure there is still oil coating the pan. If you did not add enough oil to begin with, add more oil before flipping the chicken! Trust me, if you accidentally burn this dish, your family will not eat it. Even if you try and convince them it is actually called "Blackened Pecan Chicken." Hypothetically speaking, of course. Finally, flip the chicken and let it cook for another 2-3 minutes. Remove the chicken from the pan and place on paper towels to drain excess oil. I like to eat my Pecan-Crusted Chicken over a big, leafy salad. My 4-year-old, on the other hand, says, "Mommy, I just wasn't born for salads," so feel free to serve it up however you choose. What did I tell ya? Perfection! Apparently my 4-year-old wasn't born for this chicken dish either. If you are looking for a way to get dinner on the table even faster, you can bread the chicken before freezing. Just be sure to individually wrap each chicken breast in plastic wrap and store all the chicken in a ziptop bag in the freezer. When you are ready to cook, DO NOT thaw the chicken. Pan fry the cutlets frozen. 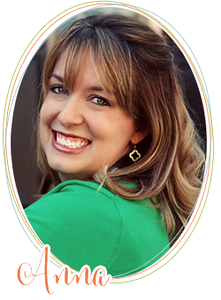 It is a little trickier and takes a couple minutes longer on each side, but it works! In a ziptop baggie, add chicken cutlets and maple syrup. Turn to coat. In a separate baggie, combine panko bread crumbs, chopped pecans, salt, pepper and herbs. Add both baggies to a large gallon bag and freeze entire bag. When you are ready to cook, thaw entire meal kit. Coat each chicken breast with pecan mixture, pressing to ensure that the mixture sticks. Heat oil in a medium skillet. Make sure you have enough oil to coat the pan. 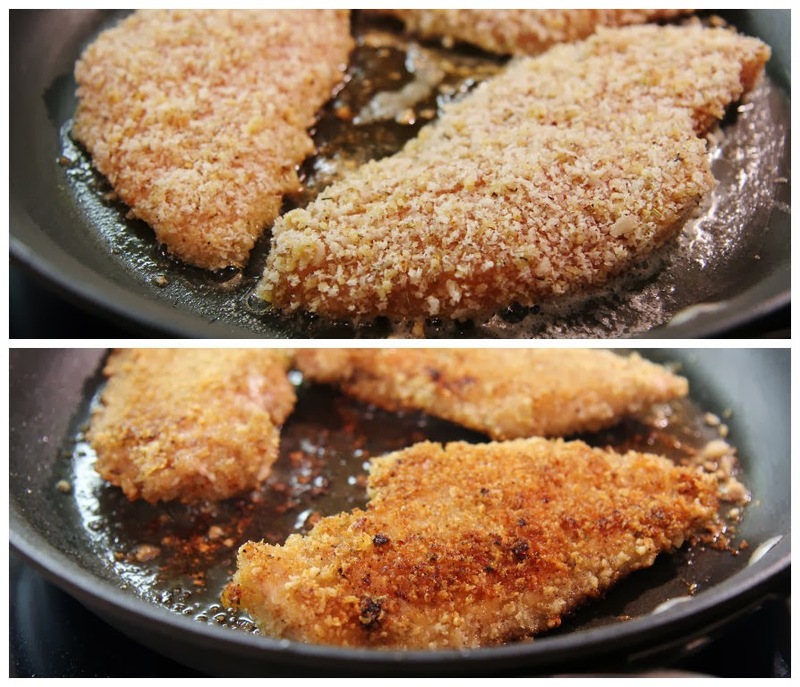 When the oil is hot, add 2 to 3 chicken cutlets to the pan - don't overcrowd! Leave the chicken alone to cook for 2 to 3 minutes - no peeking! Then, flip each chicken breast with a spatula. Again, let the chicken cook for 2 to 3 minutes without poking or moving the chicken. Remove the chicken from the pan and place on paper towels to drain excess oil. Serve and enjoy!